White 2015 SUV/Crossover for AED 115,000. Beige interior. It features 4WD, 17 inch wheels and leather seats. 6 cylinder white 2014 SUV/Crossover. Beige interior. Sunroof, 17 inch wheels and ABS. GCC spec manual, 17 inch wheels, 4WD, power windows, grey interior, burgundy exterior. GCC spec white SUV/Crossover, beige interior with CD player, 4WD and a 4 cylinder engine. GCC spec 2005 Toyota Prado, white SUV/Crossover with beige interior. It features tuner/radio, 17 inch wheels and 4WD. Black SUV/Crossover with beige inside. It has air conditioning and power windows and has 17 inch wheels. GCC spec Toyota Prado, white SUV/Crossover with beige interior. It features ABS, 17 inch wheels and fog lights. GCC spec automatic, 17 inch wheels, AUX audio in, 4WD, beige interior, white exterior. Automatic Toyota Prado with 17 inch wheels, MP3 interface, fog lights, white on the outside, beige interior. GCC spec automatic, 17 inch wheels, cruise control, spoiler, brown interior, grey/silver exterior. Automatic 2015 Toyota Prado with 17 inch wheels, climate control, airbags (front and side), beige interior, white exterior. GCC spec. Automatic Toyota Prado with 18 inch wheels, AUX audio in, xenon headlights, beige interior, white exterior. GCC spec white SUV/Crossover, beige interior with parking sensor rear, keyless go and a 4 cylinder engine. GCC spec Toyota Prado, grey/silver SUV/Crossover with beige interior. It features ABS, 20 inch wheels and AUX audio in. Automatic 2015 Toyota Prado with 17 inch wheels, power seats, keyless go, beige interior, white exterior. GCC spec. 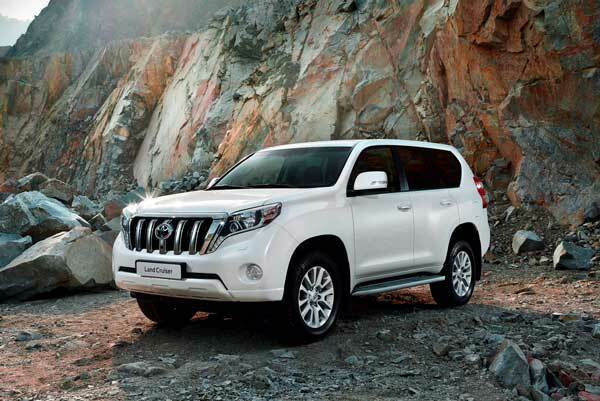 Toyota Prado for AED 37,000 with many features, including power windows, air conditioning, airbags (front and side). Grey/Silver with beige interior. GCC spec 2014 Toyota Prado, 4 cylinders, grey/silver SUV/Crossover with beige interior. It comes with CD player and parking sensor rear. Automatic 2015 Toyota Prado with 16 inch wheels, tuner/radio, 4WD, beige interior, black exterior. Grey/Silver 2015 4 cylinder SUV/Crossover. Beige interior. It has spoiler and USB. Opportunity! A 2012 white Toyota Prado now available at a reduced price. Automatic Toyota Prado with 17 inch wheels, power windows, CD player, beige interior, green exterior. GCC spec Toyota Prado, grey/silver SUV/Crossover with beige interior. It features air conditioning, 18 inch wheels and CD player. GCC spec Prado from 2013 with a 6 cylinder engine. White SUV/Crossover with beige interior. It has MP3 interface and alarm. GCC spec Toyota Prado, white SUV/Crossover with beige interior. It features airbags (front and side), 17 inch wheels and climate control. 2015 Toyota Prado with features such as USB, tuner/radio, bluetooth system. It has beige interior and is White. GCC spec. White SUV/Crossover with beige inside. It has cruise control and differential lock and has 17 inch wheels. What do our customers say about the Toyota Prado? Muhammad - I think it’s one of the best family SUV’s out there with a lot of space. Fuel economy is great and it even goes off road with minimum maintenance costs and parts. I would highly recommend the Prado to those looking for mid sized SUV’s. Pros: Spacious, fuel efficient and durable. Alan - When I was looking for a second hand Toyota Prado for sale in Sharjah, UAE I was surprised by the quality of the cars I test drove. Great SUV for everyday purposes and weekend trips to the desert or wadi bashing, sometimes a little more power is required. However, my Toyota Prado has never let me down. Pros: Off road capabilities, easy to drive and reliable. Cons: Needs more power and bland design. Nina - Excellent for school runs, taking the kids to football practice and everyday errands. Also extremely useful for family outings like dinners, parties and trips to the movies. The best thing about Toyota Prado’s it’s easy to maintain with easy access to parts although not much are required. Pros: Cheap maintenance and tremendous resale value. Cons: Not enough rear entertainment for kids. How many fully grown adults can fit in a Prado? Seven, making it the perfect car for road trips, desert camping and school runs. Some models can fit up to nine, and short wheelbase models can fit up to five. It’s popular. And because it’s so popular it’s got resale value. 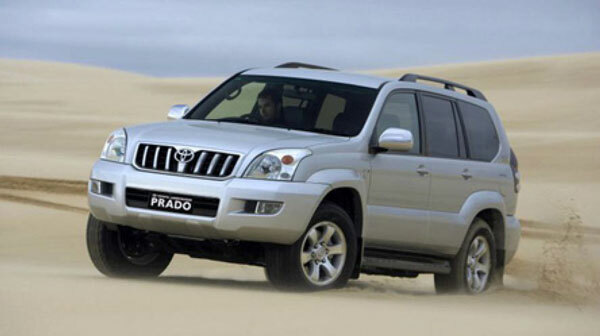 If you are looking for a used Toyota Prado for sale in Sharjah, UAE - be prepared to find plenty. Reliability, Toyotas are known for the robustness, in turn making trips to the service station few and far between. Practicality, latest models have exactly what you need: diff lock, fridge, parking sensors and navigation, it has all the necessities. Did you know the Toyota Prado has been around since 1984? Over the years it’s received major and minor touch ups and remained popular in the eyes of UAE residents since it’s inception, and for good reason. 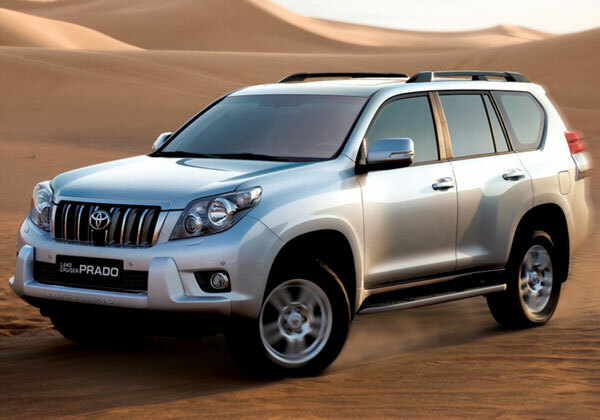 The majority of the UAE is covered in sand and new or used Toyota Prado SUV just loves to play in the dunes. Sure, it hasn’t got the flamboyant curves or ultra luxurious options, but it gets the job done. Anywhere between five to eight people can fit inside comfortably. Road Rivals:Ford Explorer, Honda Pilot, Mitsubishi Pajero and the Nissan Pathfinder. Manual or an automatic gearbox were on offer mated to either a V6 or four-cylinder petrol engine. Even though it may be over ten years old, at this point standard features include a fridge, radio tuner and air conditioning. Side airbags and stability control were not part of the complete package. However, ABS and front airbags were. After a seven-year span, Toyota decided to update the popular SUV; a new front grille was attached with refreshed headlights. Curves covering the wheel arches were enlarged on all four corners to keep in tune with modern car design. This revised Prado also bought the flat third-row seating option and a nine-seater option was on offer but was rarely seen on the streets of the UAE as it was mainly exported. Once again, a 2.7-litre four cylinder coupled to a four-speed automatic or a five-speed manual gearbox. For those wanting more power, the 4.0-litre V6 engine returned paired to either five-speed automatic or six-speed manual. Three trim models were available starting from VX, VXL and topping the ladder TXL. Top tier Toyota Prado’s featured leather seats, digital A/C, JBL sound system, fridge, keyless start and a rear entertainment system. Optional extras included a multi off-road selector to tackle any terrain, four cameras, adjustable air suspension and parking sensors at the front and back. Lower trims have their seats covered in fabric or leather interior and less options. 17-inch rims were standard, however VXL models rolled on 18-inch alloys. 2014 saw the latest refresh of the Toyota Prado, with an updated grille and headlights, the Japanese manufacturer gave it a breath of fresh air to compete with the mid-sized SUV’s, of course being so durable and affordable it’s still a mainstay no matter what. Once again proving very popular over the years the 2.7-litre and 4-litre petrol motor returns this time only mated to an automatic gearbox. Manual transmissions were on offer in other GCC countries such as Saudi Arabia. Entry level EXR models utilise the four cylinder motor, rides on 17-inch rims and lots of black bits such as the front grille, window casings and door handles. Inside, there’s front and rear air conditioning, dual airbag system, fridge and standard stereo system with AUX/USB inputs. Nestled in the middle is the Toyota Prado GXR, with its chrome front grille, rear parking sensors, matching coloured trims and side steps are all standard when it comes to the outside. Most of the options found in the EXR transition across of course with some minor upgrades, digital A/C and cruise control are two deal breakers. Those wanting powered front seats, leather interior, reverse camera and stability control should be on the lookout for a Toyota Prado VXR. Now for the V6 models, three models are on offer to choose from starting from the EXR models which features keyless start, Bluetooth pairing, cruise control, media inputs, ABS, leather seats and reverse camera. Up next is the GXR model, which receives the same features as the EXR with additionals such as powered front seats, rear mounted tow hook and spare wheel. VXR models stand just above and feature those previously mentioned options as well as a sunroof and aftermarket media system. Sitting right at the very top of the Prado food chain is the VXL. Rolling on 18-inch alloys and flash LED headlights, the interior is packed with cooled front seats, memory options, premium JBL sound system, parking sensors and everything else lower tiers feature. It’s unknown if the nine-seater variant is available in this generation at least in left-hand drive spec. So now you know everything there is to know about the Prado, it’s about time you get yourself a used Toyota Prado for sale in Dubai and Toyota Prado in Abu Dhabi.